As I have said before I am always on the lookout for great hair accessories. This has been a mission of mine since Sadie was born with a head full of hair. And guess what??? Gracie has a head full of hair too. Its not as thick as Sadie’s but its still a head full. So my mission continues. For review from The Bowtique I received some pretty awesome hair stuff. Sadie really liked the Pretty in Pink Pony O. 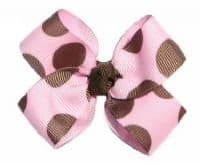 It is pink and polka dotted ribbing attached to a hair elastic. It is so her($7). I loved the Felt Flower Pony O. The Pink flower with the Chocolate center goes with all the pink and brown in clothes right now. They are secure and stay in ($7). Jillian also sent me a felt cupcake clippie for Gracie to try. I love that the clip is tiny for her baby fine hair yet the cupcake is a bigger size so I wouldn’t be too worried about her putting it in her mouth. We also got to try out the Felt Flower Hair Clip Holder($15). It holds a massive amount of clips. It is 3 feet long and oh so cute. 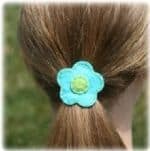 It makes a wonderful gift for a little girl with lots of hair clips. 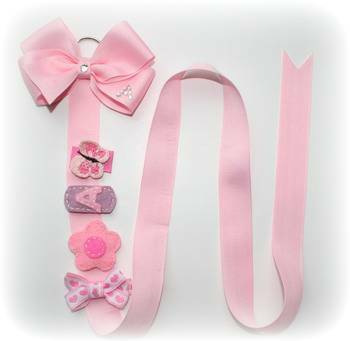 Be sure to browse through all the different patterns and styles that The Bowtique has to offer. Save 15% on your purchases from The Bowtique with the coupon code SS15. Love the look of the felt flower clip holder, too cute!